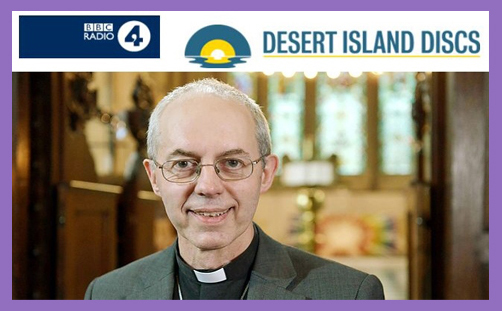 The Archbishop of Canterbury, Justin Welby, was Kirsty Young’s castaway guest on BBC Radio 4’s Desert Island Discs today, and his narration of fascinating biographical anecdotes with intermittent spiritual reflection was as illuminating as his choice in music. ‘In the Jungle’ (aka ‘Wimba Way’), which he says is a “family joke”. The Lion sleeps tonight? Not The Lion of the Tribe of Judah, one presumes. Then came Beethoven’s Sixth Symphony, the ‘Pastoral’, which reminds him of childhood safety, security and idyl. And then Tavener’s glorious ‘God is with us’ – “It says everything: it’s breaking into the darkness,” the Archbishop said. Then there was a South Sudanese song, because Africa had and continues to have an enormous impact on his life. They sing of “their faith, trust, and joy in God in the midst of absolute horror”. Matt and Beth Redman’s ‘Blessed Be Your Name’ brought an injection of contemporary worship, followed by a piece which reminded him of the time he was invited to become Dean of Liverpool and he recalled hearing ‘You’ll Never Walk Alone’: it brings to his memory a “lively, humorous city” healing the wounds of Hillsborough. Then he chose the work commissioned from composer Michael Berkeley for his installation as Archbishop of Canterbury, based on the the Rule of St Benedict. And finally, Benjamin Britten’s War Requiem – a passionately powerful piece exhorting pacifism with the poetry of Wilfred Owen – he says it’s his “favourite bit of music in the world”. The Archbishop exhorted the virtues of honesty and humility, and repudiated ‘holier than thou’ judgmental piety. He spoke of the need for compassion in the context of personal failure and sin, and told us that he doesn’t feel up to the task of being Archbishop any more now than he did when he first wrote his application (which he was instructed to do). We glimpse his spirituality and glean his priorities. There is nothing more important to him than prayer and reading the Bible. “Evangelism,” he says, “is a church word for seeking to share the Good News of Jesus Christ with people.” His mission is to speak of God’s love, and to be confident in light and love of Christ. His ‘luxury item’ was the complete boxed set of The West Wing. How does the BBC report all this? Why, ‘gay marriage‘, of course. Isn’t ‘Welby loves Wimba Way’ sufficiently captivating?